I groan every time I see the forecast calling for temperatures in the mid-30’s. The truth is that once I get on my scooter I tend not to notice the cold temperatures. Sure, riding on a sunny, 70-degree day is optimal, but I’m thrilled enough that I can be out enjoying the wind in my face while zipping around DC. Of course my legs go a little numb, but to me it’s totally worth it! Obviously I wrote this before I changed jobs, back when my commute was 3-5 minutes and the maximum speed between stoplights was 25 MPH. Now my commute is 10-15 minutes each way, and part of it involves roads where the speed limit is 55 MPH. Needless to say, hopping on the Vespa when the temperature is below freezing and traveling at these speeds for this amount of time requires some preparation. A friend from the cycling world introduced me to the balaclava, a ski mask that is thin enough to fit underneath a helmet. Unlike a scarf, the balaclava will stay in place, covering the nose, mouth, chin and neck. I found that most balaclavas are designed for cyclists, and allow too much cold air to get through (to help keep a sweaty biker cool). My search brought me to Klim, a maker of snowmobile accessories, which seemed the perfect cold-weather equivalent of a motorcycle or Vespa. 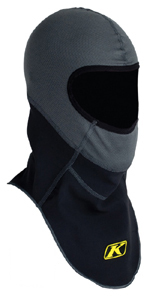 Enter the Klim Balaclava. The upper portion is made of cooler material (Coolmax, according to the product specs) to keep heat from being trapped in the helmet. The exposed bottom portion is made from Gore Windstopper material that, like the Gore-Tex insulation used in winter coats, is extremely light weight but very effective at keeping cold wind from hitting skin. You can pick up your own Klim Balaclava here. The drawbacks? Balaclavas tend to project exhaled, moist air up into any eye wear or face shield you may have. When in motion, this isn’t a large problem because enough cool, dry air is coming in to keep fog from forming. However if stopped at a red light, the visor/glasses can fog quickly. You can help avoid this by exhaling through the mouth, or lifting the visor when stopped. Check back later this week for the continuation of this series, Winter Riding? No Problem!, when we talk riding jackets.